Proudly sporting an arc of text at the six o’clock position and an embellished logo at the 12 o’clock mark, the Victorinox Swiss Army Men’s 241444 chronograph isn’t shy about its heritage. The timepiece renounces conservative styling by promoting elegance and classic refinement. The black dial is framed by an inky bezel that’s marked at equal points by a beautifully engraved tachymeter scale. Combined with the three chronograph subdials, the overall emphasis of the watch is obviously on pairing unparalleled timekeeping with striking good looks. All the elements required to chisel the best tough analog watch in the Victorinox class are assembled in the Swiss Army Men’s 241444. 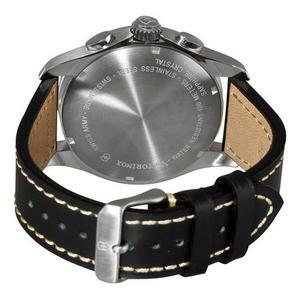 A leather strap with tight stitching hugs the wrist of the man lucky enough to own the wristwatch. A twist of the same wrist is all it takes to show off the dial and the three elegant subdials as they count off hours, minutes, and seconds with peerless accuracy. A closer look at the face of the 241444 shows why the Victorinox range always makes it into the rarefied heights of the best tough chronograph watches list. I’m talking about pure toughness and waterproofing. 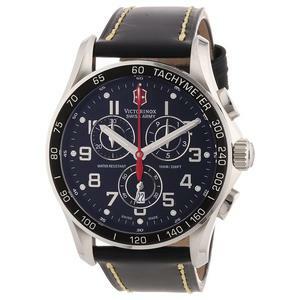 I’ve personally worn this watch, and it looks good, feels better, all while radiating an assured sense of durability. This feeling doesn’t come from any sixth sense. It comes from keenly observed details and practical additions as precisely engineered by a Swiss made legacy of top timekeeping engineers. Just to illustrate my point, a triple-coated anti-reflective coating reduces glare when taking the watch down to its maximum diving depth of 100-Meters (330-Feet). That coating sits upon a sapphire glass crystal window, a protective layer designed to defend the classic good looks from disfiguring scratches. A wristwatch capable of combining highly-fashionable style with a rugged stainless-steel case is one thing, but the story doesn’t stop here. The Victorinox Swiss Army Men’s 241444 chronograph classic is one of my favorite timepieces because of more than class-leading dependability and a reputation as one of the finest watches in a crowded category. It’s the little things that make the difference, combining to create a competitor for best tough watch in its category. The 45-mm case hugs my arm evenly, putting the wide luminescent hands on display as they sweep gracefully around the dial. The timekeeping functions are controlled by a legendary Swiss quartz movement mechanism. A tiny but easy to see date marker is framed by a small rectangle at the 6 o’clock position, and the silver tone that shades the hands and Arabic hour markers contrasts perfectly with the slate-black dial. 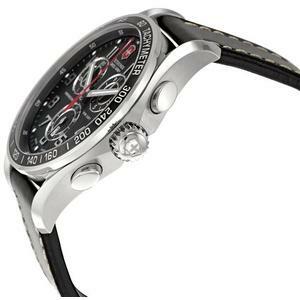 Among the best tough chronograph watches on the market today, this wristwatch acquits itself with typical Swiss authority, delivering style and precision that’s wrapped in one impenetrable stainless steel case. Quality materials are the only acceptable way of constructing a Swiss made watch, and this fact is delightfully proven right here. While I found the watch remarkably comfortable to wear for extended periods, some owners have remarked that the edges of the case are quite sharp, as is the crown. On the whole, the majority of men wearing the 241444 do not find the watch uncomfortable. The stainless steel case has rounded edges, as does the prominent crown. Thus, purchase this sophisticated timepiece in confidence, knowing it’s available at a substantially reduced cost from many reputable websites and stores. Charmingly elegant and tough, the Victorinox Swiss Army Men’s 241444 chronograph classic is high on the checklist of any man looking for a prospective contender for top all-round chronometer, combining a stylish profile with exacting internal movement.